The Press Association is partnering with search engine giant Google to provide election data on all of the parliamentary candidates standing around the country. The agency is to supply the data for Google’s ‘Make Up Your Own Mind’ election search, where web browsers users will be able to easily search for the name and image of the candidates standing in a constituency by typing in the name of the town or postcode. Google’s search results will include the photo and election card information of nearly 4,000 candidates nationwide. The election data and candidates image feed will start providing data this month, extending through to the live results on election night on 7 May. 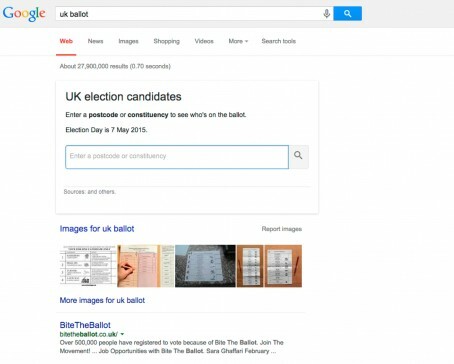 Matt Cooke of Google’s News Lab added: “As a European first, everyone who needs to find quick answers on their local MPs, the results or topical details can view this easily on Google via a series of ‘search cards’ we call the OneBox. As previously reported on HTFP, PA is also teaming up with Facebook to power its UK Politics community page, where the best election stories will be curated.